With the upcoming elections, numbers can reveal important information. Unfortunately, our human brains are not that great at translation lots of numbers into a coherent stories. That's why we need charts and table to summarize and preset the data for us in meaningful ways. The first questions that come to mind are: which are the gewogs with the highest numbers of eligible voters? The lowest? The difference between the highest and lowest? etc. We explained in many previous posts that pie charts are notoriously ineffective for conveying information and answering basic questions such as those above. 3D charts are even worse. Pie charts not only make it difficult to decipher information, but they can also lead to misinformation. I once again diligently created a bar chart version to help us all better see the data. While doing this, I started wondering about the meaning of these numbers. How do they relate to the population size of the gewog? I went to NSB's website and grabbed 2011 gewog-wise population statistics for Thimphu. I then compared the eligible voter numbers to the population numbers. 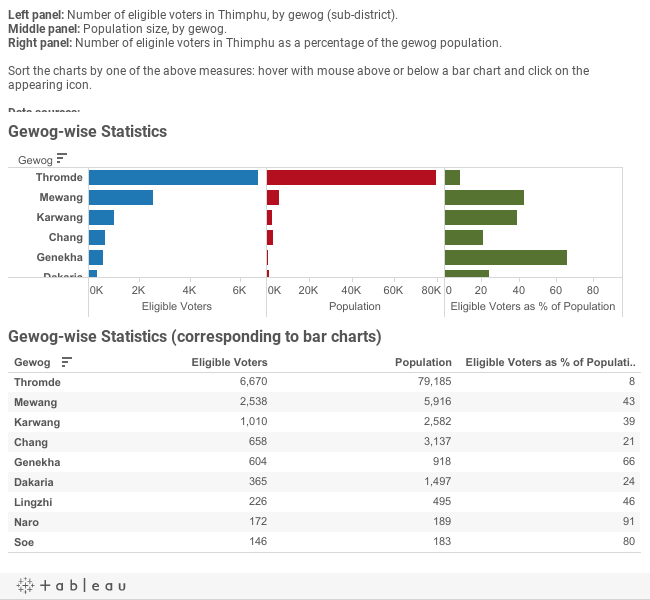 I also computed the eligible voters as a percentage of that gewog's population. Take a look at the dashboard below. 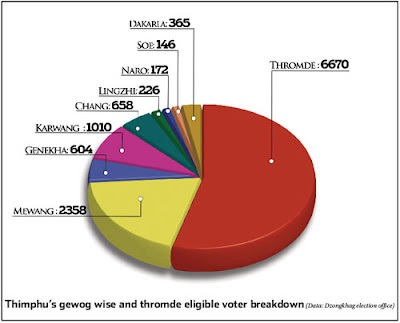 Not surprisingly, Thimphu Thromde has the largest number of eligible voters (those eligible to vote in Thimphu). But, relative to its population, it has the lowest % of eligible voters (8%). Maybe this is not surprising, because so many Thromde residents are not "native". The next two gewogs with highest eligible voter numbers are Mewang and Karwang. If we compare to population numbers, the third largest gewog after Thromde and Mewang is... Chang! (sort by the red bar chart or table below it). This means that Chang, although 3rd in terms of population size in the dzongkhag, has a relatively low number of eligible voters. Finally, sorting by % of eligible voters (green bars), we see the actual percentages in each gewog, with Naro leading (91% eligible voters) and then numbers declining ten-fold when we get to Thromde (8%) . Whether the actual voter numbers tell a more important story than their percentage of the gewog population, our main point is to highlight the power of bar charts (and especially when sorted by bar length), and the inappropriateness of pie charts, not to mention 3D pie charts. Once again, we subscribe to visualization expert Stephen Few's motto "Save the Pies for Dessert".